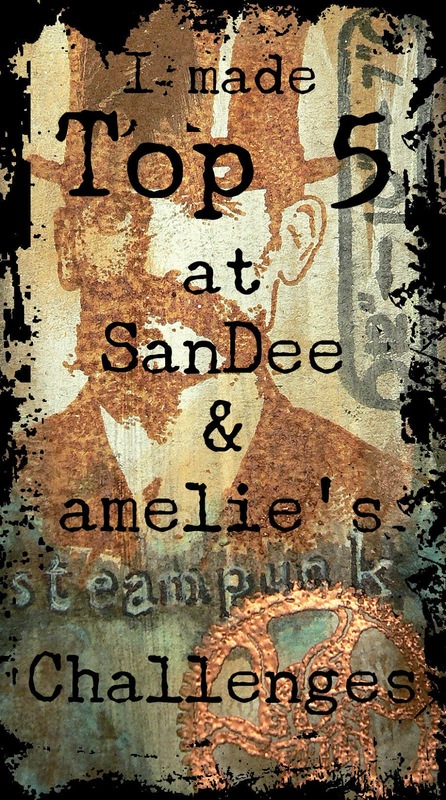 SanDee & amelie's Steampunk Challenges: New Year - New Top 5 - New Prize Winners! 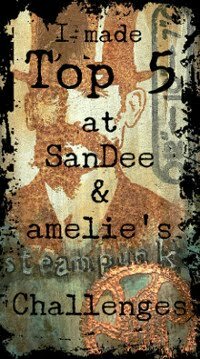 New Year - New Top 5 - New Prize Winners! Yay! 2017 is already in full swing and it's time for our first Top 5 and prize winners announcement of the new year! The team and I hope that you all had lovely holidays and wish that your new year may be filled with loads of joy, fun and success on your new creative adventures! We also want to say thank you to those who made the time to play along with us in December! Picking our favourites was hard as always but pick we did! 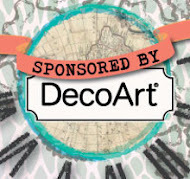 But before the Top 5 will be announced I want to add "New Year - New Prize" to our headline, as I have put together a new DecoArt media prize bundle for you, so those who might win another time don't get the same products again...and of course this is a wonderful opportunity to introduce to you some other products from DecoArt media's wide range of fab mixed media stuff! 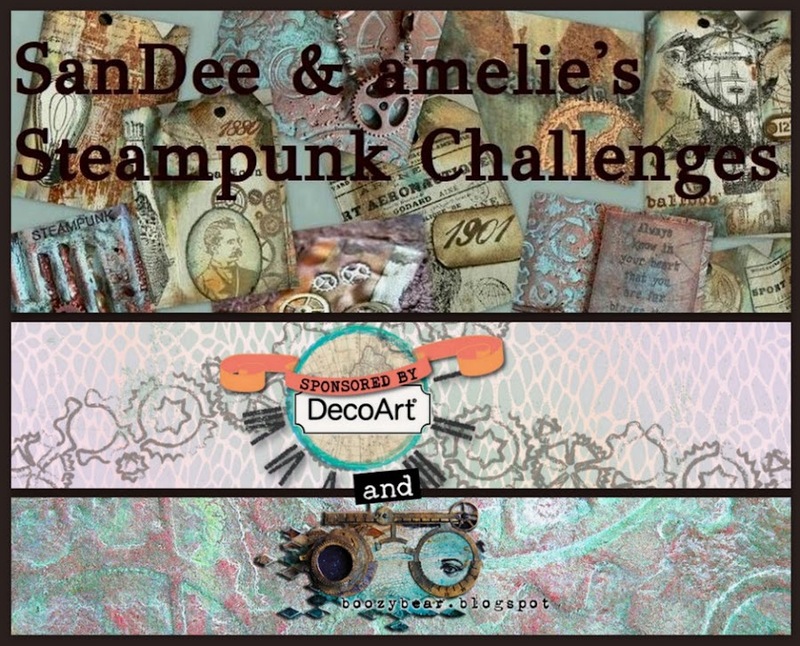 I so hope that you will like what I have chosen for the 2017 DecoArt media prize bundle! 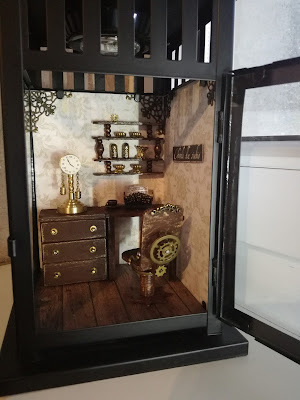 There's some black modeling paste and white crackle paint, then one of my favs - Liquid Glass - and two of the antiquing creams in the package besides a black spray mister, some Metallic Lustre and some of the fluid acrylics that are my most used when creating steampunk projects. 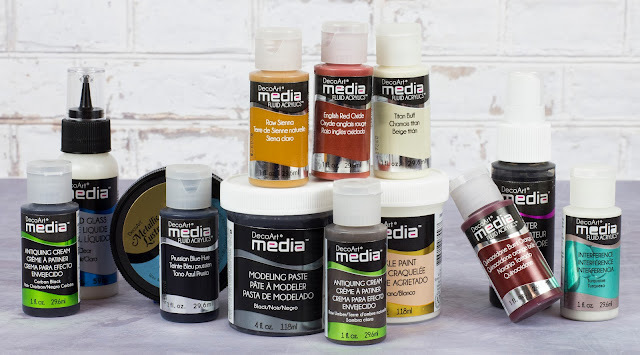 So this should be great fun to work with and create some stunning mixed media effects! 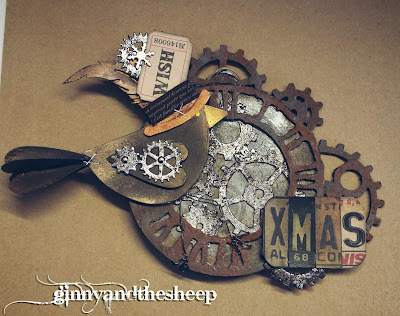 And of course lovely Glenda, owner and designer of the fab boozybear steampunk chipboard pieces, is with us again! Yay! We're so happy to have her with us! Yay! Congrats on your wins, ladies! Please, contact me via email (address is to be found in the side bar), so we can arrange everything! You have four weeks time to claim your prizes - so don't wait too long! ;) DecoArt prize winners, please, add your phone number to your shipping address for safer shipping. Before I lift the curtain for our first Top 5 in 2017 I want to remind you of our actual challenge that has already gone live and is still open until the end of the month. You get there by clicking HERE. And there's another bundle of inspiration to follow so your creative energy for this challenge gets fuelled - the makes of Team B will be presented on the 15th as usual. So make sure you don't miss their 2016 favourites! Huge congrats, ladies! What fantastic makes to share with us! Please, feel free to grab the Top 5 Badge for display on your blogs! But - as always - we always have been loving all the projects being entered by all of you, our wonderful players, and being inspired by your creativity and different approaches! 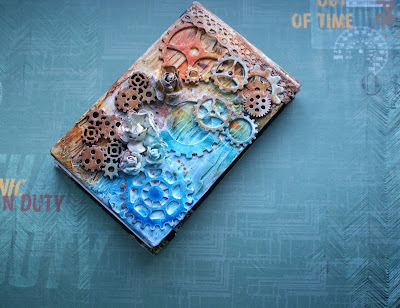 Thank you all so much for playing along and sharing your wonderful mixed media, tag, card, altered,...art with us! We hope to see you play along in 2017 too! See you on January 15th! Danke schön für die Belobigung :) Ich freue mich sehr!